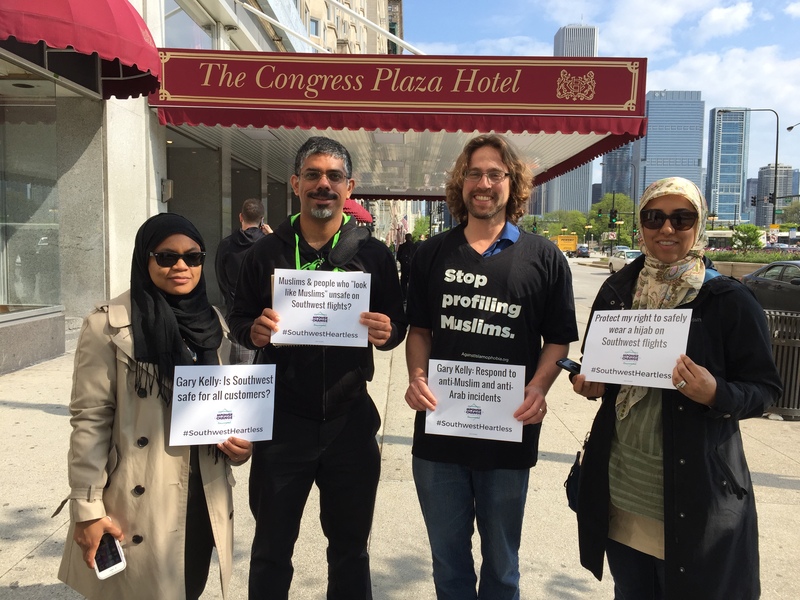 Arab and Muslim protestors demand an end to profiling at Southwest Airlines stockholders meeting. On Wednesday morning, Southwest Airlines held its annual shareholder meeting in downtown Chicago. This year the stockholders were greeted by Arab and Muslim groups who were protesting the trend of anti-Muslim and anti-Arab incidents on Southwest Airlines flights. The groups also showed solidarity with the picketing pilots, flight attendants, and mechanic union members. Even with a strong response and thousands of signatures on a petition, Southwest has either been silent or released statements that promote their concern for passengers’ “safety” and have avoided taking any responsibility for their staff’s bigoted and discriminatory actions. In November of last year, Maher Khalil and Anas Ayyad, who both moved to Philadelphia 15 years ago from Palestine, were speaking Arabic before their flight in the Chicago Midway Airport terminal when another passenger on their flight approached the gate agent, demanding they be removed from the flight. The agent agreed and told the men that they wouldn’t be allowed to board because a passenger was said he was afraid to fly with them. This response is clearly corporate double speak that absolves their employees of any blame for discriminatory behavior and the airline itself for any clearly flawed procedures. In another case that month, an Iraqi student was removed from a Southwest Airlines flight for speaking Arabic. Khairuldeen Makhzoomi, a senior at the University of California, Berkeley and an Iraqi refugee, was escorted off his flight by an Arabic-speaking Southwest Airlines employee after another passenger heard him use the word “inshallah,” or God willing. Protesters at the stockholders meeting focused on a petition with 20,000 signatures sent to the company in April and an open letter to CEO Gary Kelly signed by over 50 organizations that there can be no business as usual while Arab and Muslim communities are unsafe on Southwest flights. They are still waiting for a response from Southwest management. 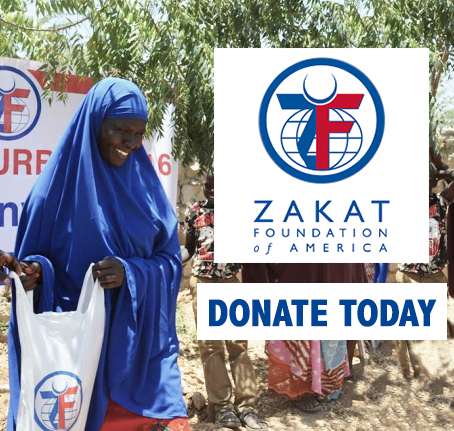 The action was organized by MPower Change, an online organizing grassroots group of American Muslims focused on social, spiritual, racial, and economic justice. Local groups in attendance included Center for a New Community, Muslim American Society Chicago, and Jewish Voice for Peace – Chicago. Kalia Abiade from Center for New Community, an advocacy and research organization, described how her organization fights the perception that organized racism is a thing of the past. She stated that the actions of Southwest Airlines and the Trump campaign demonstrate that anti-Black and anti-Muslim sentiments are very much still major issues. Dalia Hassaballa, a Board member of the Muslim American Society Chicago, was representing her organization’s focus on the vision of a virtuous and just society that doesn’t include profiling Arab and Muslim passengers on Southwest flights. “Injustice anywhere is a threat to justice everywhere.” We are here to stand along side of the Muslim community to protest Southwest Airlines disgraceful enabling of anti-Muslim racism and profiling. From North Carolina, Manzoor Cheema, a member of the Movement to End Racism and Islamophobia, made the connection between the protestors and the pilots, flight attendants, and mechanics picketing for better pay, benefits, and working conditions. 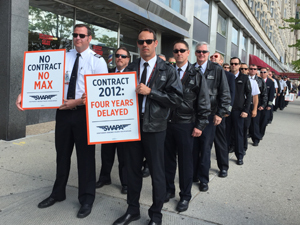 The Southwest pilots have been without a contract since 2012. John Weaks, President of the Southwest Airlines Pilots’ Association (SWAPA) described the pilots’ pay, retirement, and scheduling being far behind the other three major carriers. This has lead to a major recruitment and retention problem for the airline. 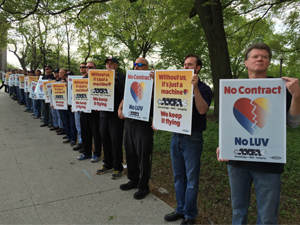 An estimated 10 percent of the Southwest pilots participated in the protest. Flight attendants from the Transport Workers Union (TWU) Local 566 and maintenance workers from the Aircraft Mechanics Fraternal Association (AMFA) Local 4 also joined the pilots on the picket line. Justin Madden, National Secretary/Treasurer of AMFA, described similar issues that the mechanics have with Southwest management. This protest shows that that Southwest Airlines is not only failing to protect its passengers from anti-Arab and anti-Muslim bigotry, but also is not treating their employees with respect and fairness. Like the Southwest Airlines pilots, flight attendants, and mechanics, the Arab and Muslim groups are also waiting to hear back on their grievances from a thus far very unresponsive Southwest management.